Hi there! Branding with no Strategy? Look no further. I can help you with that! Are you ready to stop winging it in business and actually create a can-do strategy? Business strategies aren't one size fits all. Every business is different and unique and your business strategy should fit your business with where you are right now with room to evolve. Your in the right place if this is an important goal you'd like to conquer and change right now! 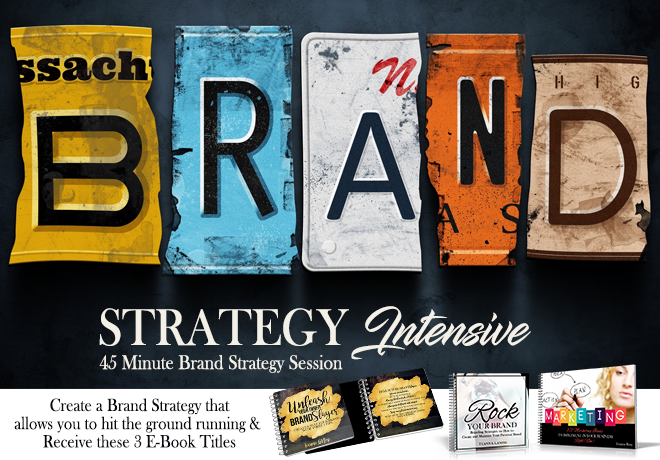 In this "Brand Strategy Intensive" you will spend 45 Minutes with me. You'll receive a digital copy of these E-Books"
- "Unleash Your Inner BrandSlayer: Create and Slay Your Brand with these 5 Tips"
- "Rock Your Brand - Branding Strategies on How to: Create and Maintain Your Personal Brand"
- "Marketing: 101 Marketing Ideas to Implement in Your Business Right Now!